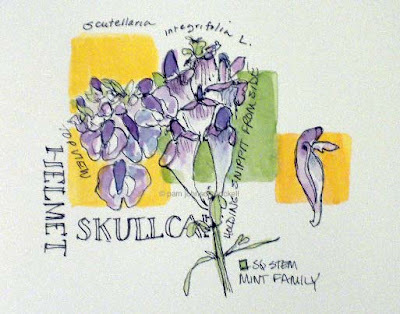 In April, I discovered my first Skullcap. A delicate mass of blooms upon a single stem. I snipped the top off of one stem and took it home to sketch. I was pleased with the sketch and waited (not patiently) for time to add words. I am saddened that last week I did not honor the sketch and take my time with the calligraphy. My spacing is all wrong and the 'P' is totally lost behind the stem and leaf. I must put the frustration involved with moving aside and get back to my meditative calligraphic self. I hate when I dishonor the gift of art. Pam, you know yourself and what you are capable of doing so yes, this isn't one of your best, but don't get too down on yourself. It's still a good painting...in fact, I think you should play up that circle of the P curving around the stem of the flower a bit more...make it intentional :) You're just a bit out of practice, as you say. 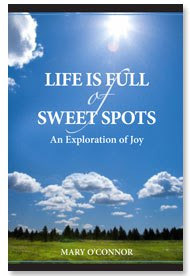 But I'll be watching you as you get back into the flow of things - and am glad you are happy in your new homeplace! You're so hard on yourself! I actually really like the illustration and the design of the page. Your lettering is usually quite good! Lisa, I sure was in a moving funk! Thanks for your support.